From prospects to residents – solutions for every stage! Residents are the priority for any community in the multi-family housing industry. At the end of the day, residents want to feel cared for and welcomed. However, getting prospective residents to become loyal residents takes time and an effective marketing strategy. Offering over 20 years of marketing solutions for the multi-family housing industry, AG Marketing Solutions has developed a Free Guide to Successful Marketing. First, ensure the tactics you employ reflect your community’s personal style. Initial designs of floor plans and community maps should be redrawn in a branded template and should be consistent with the community’s unique brand, including the color scheme, fonts, and logos. This style should be consistent throughout any marketing campaign to help build your brand and to make your brand, which is associated with the welcoming residential environment you offer, recognizable. The goal of any residential community is to turn prospective residents into loyal and satisfied customers. In order to do so, you must first attract the attention of prospects. Use print methods such as direct mailing, property brochures, promotional flyers, and business cards to get the word out about your residential community. You should also utilize giveaway items to attract prospects. These can include pens, stickers, magnets, and keychains. 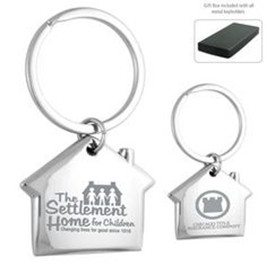 For example, the “Home Sweet Home Laser Engraved Metal Key Holder” is a perfect giveaway that will help advertise your community. You can also ask local businesses to keep brochures on display to help spread the word about your community! Outdoor marketing is very effective in attracting attention of people walking or driving by. Does your community have a pool or is it pet-friendly? Adding curb appeal can increase awareness and highlight features of your community that make it unique. Your community is your stage! Items such as yard signs, banners, balloon kits, pole banners, and flags are perfect to grab the attention of passersby. Once their attention is grabbed and prospective residents are stopping to take a look, it will be easy for them to see the hospitable environment the community has to offer! Once you have successfully turned prospective residents into new customers, you want to make them feel welcomed. Move-in gifts show new residents how much you appreciate them. Move-in gifts can include items that new residents can use in their home. Some of these items may include glasses, mugs, cutting boards, tote and lunch bags, etc. For example, the “15 oz. 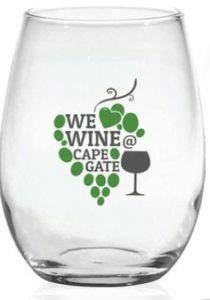 Stemless White Wine Glass” is a perfect option! Use these items to welcome new residents into their new home. After residents have been loyal for an extended period of time, it is important to show that you appreciate their loyalty. These items might be higher-end including gift sets, apparel, or technological items such as speakers and headphones. 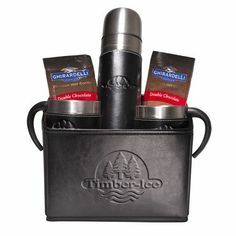 The “Empire Thermos & Cups Ghirardelli Cocoa Set” is a perfect example of this. It is essential to show residents your appreciation and to ensure that they are continually satisfied with your community and your services. By ensuring this, you can also trust that good word is spreading by word of mouth through your satisfied residents! Besides giveaways and gifts for prospects and residents, there are a few other aspects of marketing to which you should pay attention. Logistical cards and forms can also be used as a form of marketing. Guest cards for the leasing office to fill out about prospective residents when giving tours, resident ID cards to gather information about new residents, and move-in forms to provide a checklist to review with new residents upon move in are some examples of operational marketing items. Your website should reflect your community’s unique style and be easy to navigate. People turn to the internet for information, so it is important to keep your website updated and attractive. Providing floorplans to view, details about the surrounding area, and features that make your community unique, are what prospective residents are looking for when searching for their new home! Also, providing your current residents with a portal where they can easily communicate with your leasing office, pay rent online, and submit work orders, will provide residents with both a positive living experience and online experience! SEO and digital marketing are essential to increasing your online presence. Creating a cohesive and connected online experience with enhanced SEO, advertising on social media platforms, as well as increasing online reviews will rank you higher on Google leading more people to find you, and ultimately, to contact you! Remarketing is another aspect to digital marketing which will allow you to advertise to people once they’ve visited your website. Retargeting ads is a great tool to increase the frequency with which you reach your target audience.